The Magpie River flows through the heart of Quebec’s Côte-Nord region. This is the area north of the St-Lawrence Gulf from the Saguenay Fjord to Labrador. Along the rugged coastline, river after river spills into the St-Lawrence, bringing freshwater to sea. These rich estuaries are all wild Atlantic Salmon runs. As well they’re feeding grounds for whales, seals, dolphins, and colonies of puffins. Inland, on the glaciated rock shield, vast stretches of Boreal Forest extend into Quebec’s central mountains and to the tundra. This is one of the largest areas of intact forest in the world. It is home to common Canadian animals – black bear, moose, beaver, loons – and rare, endangered ones: lynx and woodland caribou. The earliest human inhabitants of this area arrived 8,000 years ago. For the last 2,000 years the Innu people (sometimes called Montagnais) have called it home. The Innu in the region used to live as semi-nomadic hunters. They spent summers on the coast and then travelled up the rivers in the fall. Through the winter, they hunted caribou and other animals in the north. The Innu then paddled and portaged down the rivers each spring. The first Europeans appeared on Viking and Basque fishing fleets. Then, the French settled in fishing villages along the coast. Today, coastal highway 138 connects the villages and there are few roads that extend inland. Though the road ends at Kegasksa (276 km/171 miles east of the Magpie), a small population inhabits the area further east. Known as the ‘Basse Côte Nord’ (Lower North Shore), these tiny villages, some French, some Innu, some English, are currently only accessible by a weekly supply boat or snowmobile in the winter. The French established a settlement at Sept-Îles in 1651. Soon after that a trading and fishing post was built, which eventually was ceded to the Hudson’s Bay Company. Despite the safe harbour and excellent fishing, Sept-Îles remained a small community. At the start of the 20th century it was inhabited by about 200 Acadians and 600 Innu on the adjacent reserve. The town ballooned when industry arrived, first pulp and paper, then mining and massive hydroelectric projects. Since the 1950s, Sept-Îles has been an important economic hub. 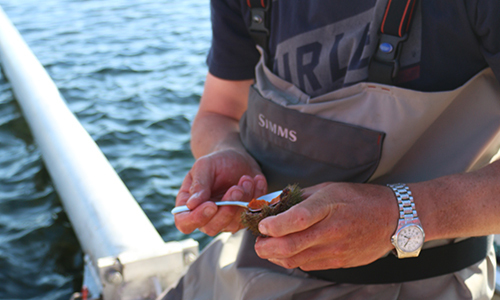 The region’s industries include fishing for crab, lobster, scallops, bourgot (whelks), and halibut, and mining in the interior. 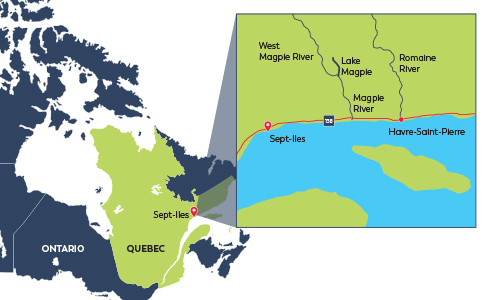 The biggest towns of Sept-Îles and Baie Comeau have mineral processing plants and shipping ports. Construction of the Romaine River hydroelectric dams began in the summer of 2009. The over $8 billion development is currently one of the biggest infrastructure projects in Canada. Other projects in the future include extending Highway 138 eastward and new hydroelectric dams. In recent years tourism has grown. 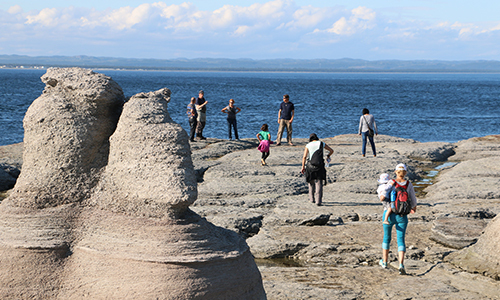 This is thanks to its beautiful landscape, rich history, and Highway 138 that follows the coast from Quebec City to Kegaska (418 kilometres east of Sept Iles). In Mingan Archipelago National Park visitors travel to the islands by motor boat and sea kayak. They are drawn by the marine wildlife, beautiful rock monoliths, and unique coastal ecology. 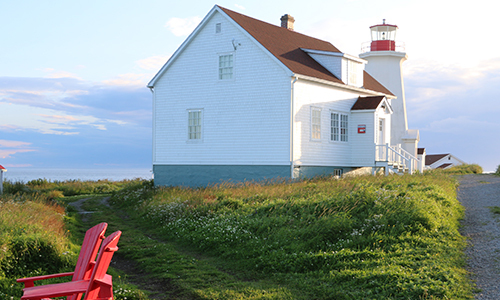 To take advantage of your time in this beautiful region, read what to do on the Côte Nord. Since the 1950’s, Hydro-Quebec has dammed many of the rivers of the region. The Magpie River is one of the few mighty rivers in the world to be virtually untouched. Read our Boreal Forest expert’s impressions of the Magpie. The Magpie is a world-class destination river. It is considered one of the best stretches on the planet for multi-day whitewater trips for kayakers, canoeists, and rafters. The river is relatively easy to access by float plane or helicopter. At the same time, it is untouched nature; the immediate sense of remoteness and mountainous landscape make for a humbling and spectacular wilderness experience. However, the Magpie remains unprotected and hydroelectric development threatens its future. This would transform the free flowing river into a network of artificial reservoirs. Read about the movement to protect the Magpie and what you can do to help.